This beautifully converted property has been a holiday cottage with Sykes cottages for the past 6 years. 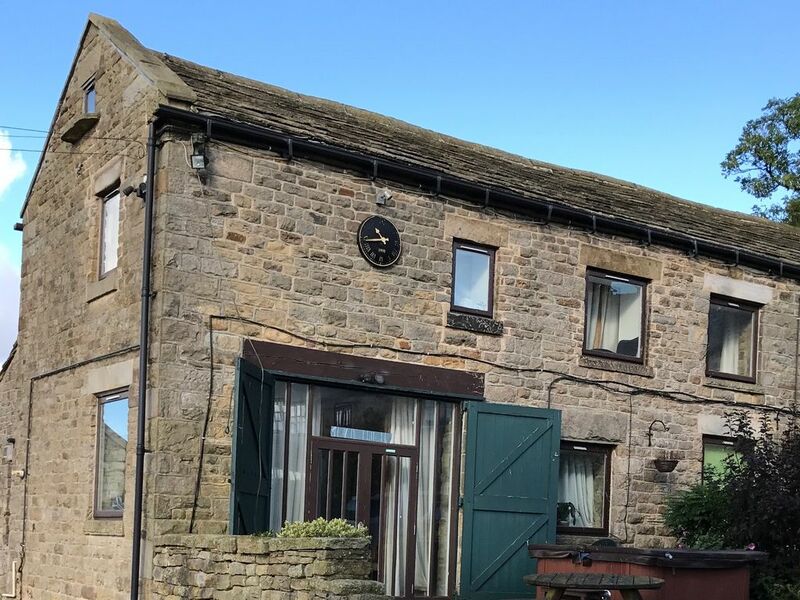 Set in the heart of the copuntryside with beautiful walks on its doorstep, is ideally situated as only 10 minutes from SHEFFIELD city centre and boasts many outstanding features including wooden floors, exposed beams and stonework. Three double bedrooms and one single bedroom. 1 King size bed with ensuite (shower, basin & WC), 1 King Size bedroom, 1 twin single bedroom, i single bedroom. Ground floor wet room with shower, basin & WC. 1st floor bathroom with toilet, sink, bath and overhead shower. Gas (LPG) central heating. Gas cooker, microwave, fridge/freezer, washing machine, dishwasher, colour TV with Freeview, Sky TV, DVD, WiFi console. WiFi broadband . All fuel & power inc. in rent. Bed linen & towels inc. in rent. . Cot & highchair. Off road parking for 2 cars. We kindly ask that the fridge is wipe out after use. Please use tin foil to protect the oven and wipe out after use. We kindly ask that the kitchen is left how it is found. We had a great time staying here the scenery was stunning and once we found the property it suited our needs. Everyone loved the hot tub!! Wonderful location! We had a lovely time staying here whilst working at the Lyceum theatre in Sheffield. This is the second time I have stayed at this delightful farm house and it didn’t disappoint. Thank you so much for this. I hope you have secured another acting job as think that may have been your last show. Superior barn conversion in an idyllic rural area. Highly recommend. Stayed in February 2019, we arrived at sunset just as the snow stopped falling and the landscape was very beautiful, almost picture-card perfect. First impressions were very favourable, everything was clean & tidy, there is a very informative welcome pack on the dining room table which is useful for finding supermarkets & restaurants in the local area, best of all the 4 seater hot tub was steaming gently and looked very welcoming indeed! The hosts (Jon & Anita) popped round briefly and were very helpful. The dining room can seat eight people comfortably, it has an original stone floor, to the right on a slightly higher level is the living room with TV and leather sofas, the kitchen at the rear of the property is a good size and well equipped with oven, dishwasher, microwave, fridge freezer and lots of drawers that contain quite a few cooking implements. Upstairs there are 4 bedrooms - two doubles, a room with twin single beds and one room with just a single bed so nominally it could sleep 7 but there are a few “trundle” beds that pull out from underneath the beds in which another 2 people could stay. There is a working dairy farm next door, we only knew this because we bumped into the friendly farmer when we unloaded our bags from the car, apart from the odd gentle mooing you’d barely know it was there. Sheffield is only a 20 minute car ride away, going the other way you have the lovely village of Castleton which boasts several underground caverns - for something fairly unique try the Speedwell cavern and take a ride in their electric powered boats through flooded underground tunnels. We enjoyed our stay so much we intend to return in the summer when the weather is a bit warmer. We had a lovely stay over the Christmas holidays and really appreciated the festive touches provided by the owner. The property is clean and very comfortable, a great base to explore Sheffield and the beautiful Peak District. Fantastic location , spacious and warm. The location is superb for walking, cycling and local attractions. It is spacious and comfortable . Plenty of room for at least 8 . The hot tub provided lots of fun and relaxation. Nice rebuilt old barn. Very characteristic with plenty of space for our family of five. Nice hot tub as well, though a bit noisy even when not used. It was awkward that the owner wasn't present during our stay (without notice) and we received the key from someone else who we accidentally met around the building. But the rest of our stay was very nice indeed. Originally part of the Duke of Norfolk estate’ the barn is situated in the small hamlet of Hollow Meadows, just 4 miles from Ladybower Reservoir in the lovely Peak District National Park and the famous Snake Pass, yet only 15mins from Sheffield City Centre. A great location for easy accesss to all areas including Ponds Forge Leisure Centre. But if you want to relax you can snuggle on the sofa and watch a film. Sit at the table and eat a great meal or relax in the hot tub in the open air. Nearly 700 lime trees line the Rivelin valley, making it the second longest lime tree avenue in Britain. Hollow Meadows holds a scattering of smallholdings, farms and dwellings and is ideal for exploring many bridleways and footpaths. Nearby are the impressive dam at Ladybower, used by the 'Dambuster' squadron to practise for their raid on the Ruhr Dams in 1945, and Hathersage, believed to have inspired Charlotte Bronte to write Jane Eyre. Edale, the start of the Pennine Way, and Sheffield, with its attractions and exciting nightlife, are only a short drive away. Sainsbury’s, Tesco and Waitrose are able to deliver grocery shopping direct to the properties. The hot tub is available during the stay, if however it needs to be refilled and reheated from cold there will be a charge of £25 (deducted from the deposit). Any damage to the property inside or out will also be deducted.